Yes, a FREE MOVIE. And now that I have your attention …. In case you didn’t know it, March is Women’s History Month – a time to recognize the important contributions that women have made to us all; to pay tribute, and to also understand the sacrifices that many have, and continue to make, on our behalf. 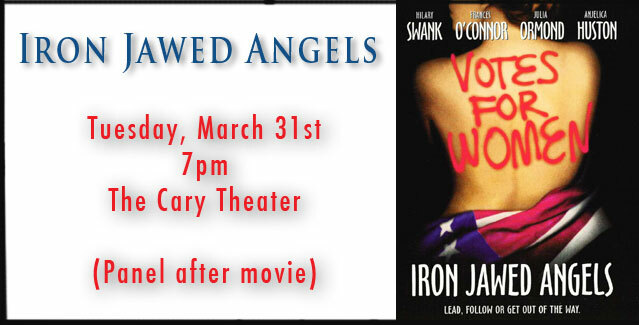 The Town of Cary, along with the National Foundation for Women Legislators will show the movie “Iron Jawed Angels” starring Hilary Swank, Anjelica Huston, Patrick Dempsey, and many more. 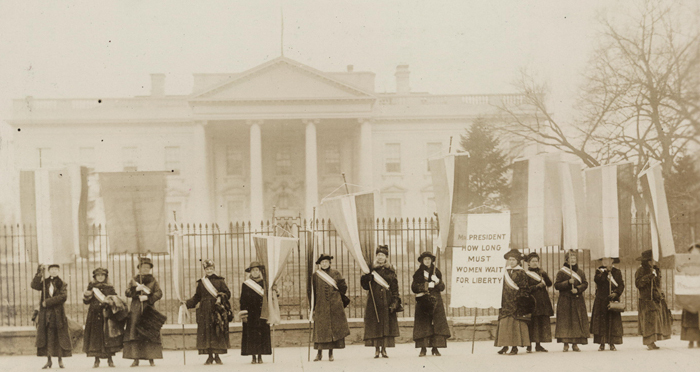 … all to celebrate Women’s History Month. 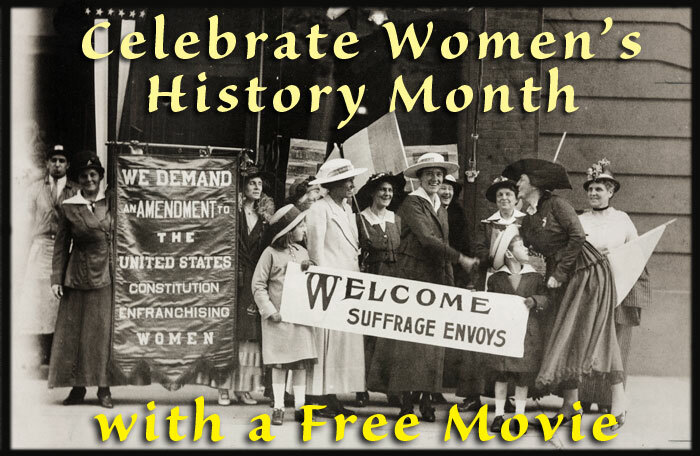 This film follows the women’s suffrage leaders Alice Paul and Lucy Burns in their struggle for a constitutional amendment granting women the right to vote. After the showing of this award winning movie, a panel of female elected officials will be on hand to answer questions from the audience, and share their unique experiences. Why focus on Women now? In the last year, we have seen a number of news stories that highlight the continuing disparity between women and men in the workforce and in public service. A recent report, called “The Status of Women in North Carolina Politics” finds “that when women seek and serve in political office – elected or appointed – they are as successful as their male counterparts. Yet women remain severely underrepresented in North Carolina political offices. The report goes on to highlight that although women make up over 54% of the registered voters in the state, they hold less than 25% of all appointed and elected offices. ▪ Out of the 100 counties in NC, in 44 of them, there are no female county commissioners. It’s not just a phenomena in Public Service. Women are underrepresented and discriminated against in Silicon Valley, where a recent Newsweek article points out that women are less likely to receive funding for their ideas, and many of the misogynitic ways of the old boys club still endure. ▪ Only 14.2% of the top 5 leadership positions of companies in the S&P 500 are held by women. ▪ There are no US holidays named after women, no women on US paper currency, and fewer than 25% of US postage stamps honoring people feature women. Research shows that the main reason so few women are in appointed or elected office is not necessarily overt discrimination – but that so few women actually seek these offices. There are many reasons for this, whether it’s lack of belief in their ability, concern of the toll it might take on their family, or lack of perceived experience. However, when they DO run, THEY WIN. From the report mentioned above, 25% of the candidates across North Carolina on the ballot were women, but 63% of these candidates won their races. Women are underrepresented in government, this is clear. And if a representative democracy should look like it’s population, we have a while to go before we get there. And here’s how and why…. 1. We need to get young women involved early. Having them aware of their impact and the important voice they have in the process of democracy is crucial. 2. Women are role models for other women. They are an inspiration, mentors, and confidants, and they want to help – just reach out and ask. 3. Women have a valueable voice to provide – they can offer a fresh perspective and a different approach to seemingly intransient problem Studies show that when you have a diverse group of people attacking a problem, you can find new ways and solutions than you would ever have considered before. 4. 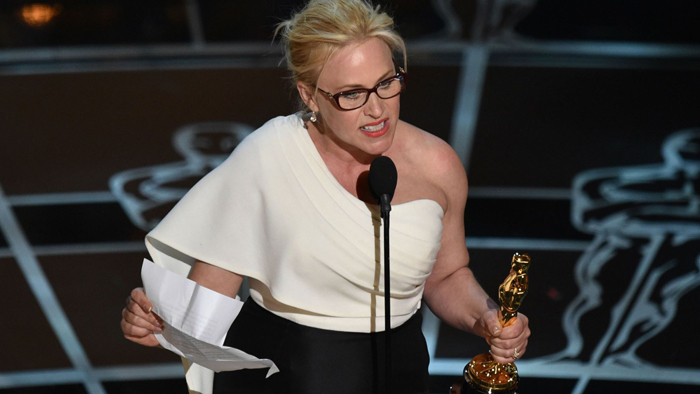 Women are a majority – a voting and buying block that can’t be ignored. Women spend 58% of online retail dollars, they make 80% of the Health Care decisions, and 85% guide and/or make purchase decisions in their household. Data from Time and Digital Sherpa. So, where do we go from here? Well, it’s time to have this important conversation where-ever and when ever we can. I’m glad to see more women involved in Public Service at the local level, and girls and young ladies taking on careers that used to be thought of as “male only.” We need to continue to support programs for Girls in STEM (Science, Technology, Engineering and Math), such as the National Girls Collaborative Project. 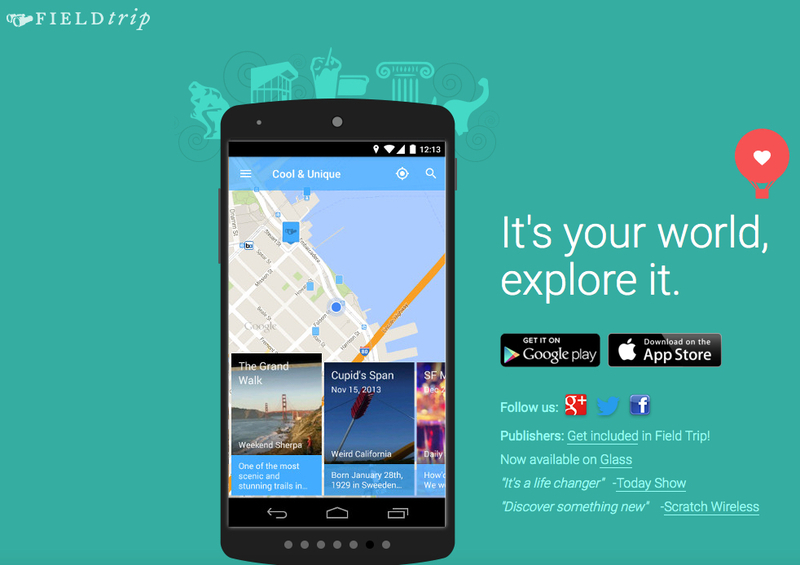 If you haven’t used this app, check it out! When you are logged into Field Trip and switch on the SPARK: Women on the Map history notifications, you will receive an alert when you are near a place where a woman made history, and then you can read more about her and her accomplishments. And finally – we need to get young women involved by inviting them to apply and be appointed for local boards and commissions, and finding new ways to encourage women to run for office, start businesses and spread their wings. And sometimes, taking them to a movie about the Women’s Suffrage movement, and showing them the strong shoulders that we all stand on, is a great place to start. Hope to see you at the movie!